The Atlantic Arc Commission (AAC) is developing a political declaration on the implementation of the Atlantic Strategy. The aim is to contribute to the European Commission’s mid-term review of the Atlantic Strategy Action Plan. 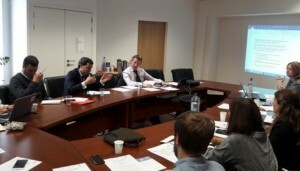 At a meeting in Brussels on 28 September, the Atlantic Arc Regions discussed their experiences regarding the implementation of the Strategy’s Action Plan. These debates will feed into the Atlantic Arc Commission’s political declaration to be sent to DG MARE. The meeting was attended by a representative of the European Commission’s Directorate-General for Maritime and Fisheries (DG MARE), which leads the midterm review of the Atlantic Strategy Action Plan. 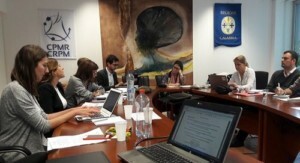 During the meeting, DG MARE provided an update on its work on the action plan’s mid-term review. It has launched a public consultation from 29 June – 29 September 2017, aimed at preparing an assessment according to the criteria: relevance, effectiveness, efficiency and added value of the Atlantic Action Plan. The AAC has already provided some input to the review by contributing to an opinion written by the European Committee of the Regions, as well as an interview led by the consulting cabinet in charge of evaluating the implementation of the strategy on behalf of the European Commission. Nevertheless, the Atlantic Arc Regions believes that it must go beyond a quantitative evaluation and make qualitative comments on the implementation of the Atlantic Strategy. In a nutshell, the Atlantic regions advised that the Atlantic Strategy helps to foster different maritime strategies for their territories, based on their needs. Some regions already had a maritime strategy prior to the Atlantic Strategy, while others have experienced a growing interest for maritime affairs, thanks to European actions on sea-basin strategies. All of the Atlantic Regions stressed that a closer relationship needs to be developed between the European Commission and the Managing Authorities, and improved governance of the Action Plan, to give visibility to the Atlantic Strategy. As has already been outlined in the AAC Final Declaration of Les Sables d’Olonne, the AAC regions requested a dedicated budget to give incentives to project partners to implement the Strategy, as well as upgrading the sea basin strategy into a macro-regional strategy. The AAC Secretariat is now finalising its contribution which will be presented during the AAC Plenary Session, to be held during the CPMR General Assembly on 19-20 October in Helsinki.